The Big Thirst: How Is Japan’s Fukushima Nuclear Plant Making “Radioactive” Water? In this installment, “The Big Thirst” author and Fast Company writer explores how water, which technically can’t be made radioactive, could be the least threatening byproduct of the hobbled Fukushima plant. FACT: Nothing is thirstier than nuclear power plants. They use water deep inside the reactor core, and they use rivers of water for cooling. One typical U.S. nuclear power plant uses 30 million gallons of cooling water an hour. The whole city of New York uses 46 million gallons of water an hour, so a single nuclear power plant needs water flow that would support a city of about 5 million people (about as many as live in the Washington metro area). And the U.S. has 104 nuclear power plants–more than any other country, a quarter of all plants worldwide. Today, the day after the one-month anniversary of the Japanese earthquake and tsunami, the thousands of gallons of radioactive water that have been leaking from Japan’s Fukushima Dai-ichi nuclear plant and back into the Pacific Ocean urgently remind us of the water required for nuclear power. Water is one of the hidden, rarely discussed environmental costs of nuclear power plants. Water, in the form of steam, is typically what’s used to turn the heat from the nuclear reaction into energy–with a turbine. But nuclear power plants also use water to help shield the reactor core from the rest of the facility, and the rest of the world. That’s what makes the “radioactive water” coming from Fukushima so puzzling. Water cannot be made radioactive. It simply won’t absorb the waves of neutrons being put out by the reactor cores. It’s in part why nuclear power plants use water right inside the reactor. It’s why “spent” nuclear fuel is typically stored immersed in pools of water. The water keeps the fuel cool, but equally valuable, it is a great radiation shield. So in what way is the water pouring from Fukushima into the Pacific radioactive? The water accumulating around the Fukushima reactors, and then leaking into the ocean, is dirty, and it’s the debris that is radioactive. 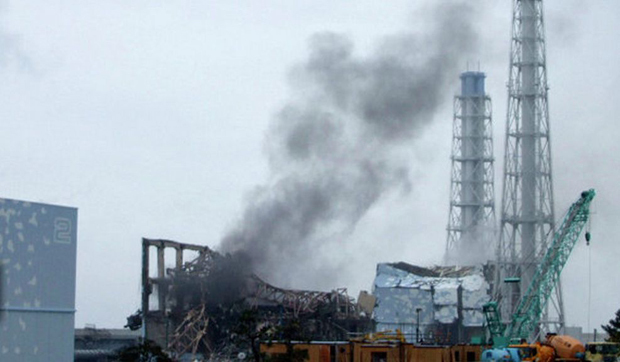 The debris may be ordinary dirt, material from the buildings after the explosions, or the failing metal and concrete structure of the reactors themselves. But since the water itself is not radioactive, it can be cleaned. Water, in fact, is one of the few substances that can be de-radiated. The radiation can be taken from it by simply filtering–basic filtering of the dirt, and more sophisticated filtering, using something called ion-exchange beds, to get both suspended dirty and dissolved substances out. It’s a bit more complicated than running the stuff from your tap through a Brita filter. But it’s also not that different. In fact, every nuclear reactor does precisely that kind of filtering all the time–nuclear plants routinely super-clean their reactor water, precisely to prevent any debris from starting to circulate (corrosion from pipes or valves, for instance) that would quickly become radioactive. The Fukushima water can be cleaned as simply as allowing it to evaporate, in open ponds. What will be left, of course, will be a layer of debris, which will be radioactive. But that material was radioactive to start–before it contaminated the water. Disposing of radioactive debris is mostly a matter of security and time–but solids don’t migrate the way water carrying radioactivity does. The Fukushima disaster suddenly reminds us how important water is to nuclear power, but all the major ways we generate electricity require huge volumes of water. In fact, electricity and water are intimately linked in a way we typically ignore. In the United States, the single largest use of water is to run electric power plants: 49% of the water used in the U.S. goes to generate electricity. U.S. power plants use seven times as much water each day as homes. And the largest single users of electricity? The nation’s water treatment plants and water pumping stations. 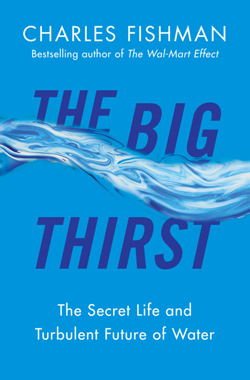 Adapted from The Big Thirst: The Secret Life and Turbulent Future of Water, to be published in April by Free Press / Simon & Schuster. © 2011, Charles Fishman. Read the feature from Fast Company‘s April issue. Read more from The Big Thirst on FastCompany.com. Read more coverage of the disaster in Japan.